My husband always orders this dish when we eat Chinese. I was thrilled to find a "healthy" version in my newest edition of Oxygen magazine. This was incredibly yummy! I was sad there were only leftovers enough for my husband's lunch! :o( Next time I think I'll double it! I will take pictures the next time I make it! 1. Cut chicken into bite-sized pieces. Heat oil in wok or saucepan, add chicken and cook until no longer pink. 2. Remove chicken from the pan and set aside. 3. Add the onion, garlic, pepper, and ginger to the pan and stir-fry 20 seconds. 4. In a small bowl, dissolve the cornstarch in the rice wine; stir in the soy sauce, vinegar, sugar and sesame oil and add to the pan. Cook, stirring until sauce thickens. 5. 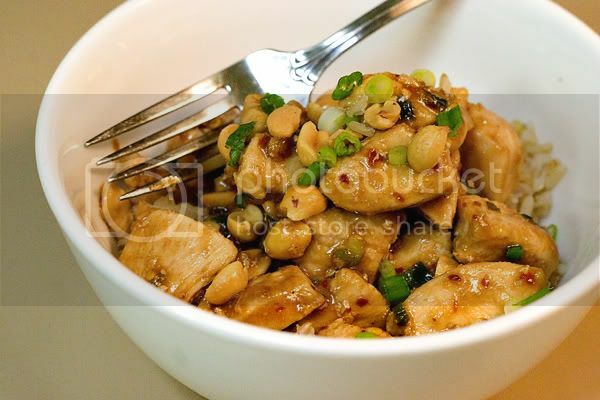 Stir in chicken and peanuts and serve with the brown rice. This looks really yummy. I may try it in my menu next week ! I am going to try the Kung Pao recipe Saturday night. I am just going to be using tofu instead. I can't wait to try it. Kung Pao is one of my hubby's favorite. Thank you for the recipe.